“What?” I said; that seemed like a lame-brained idea to me. Dad stood up, and picked up the stool and half-full pail of milk. That wasn’t all Belle had to give, but now it was time for her baby to get her fill, so I let my little one go to her Mama. Belle threw her head back in the stanchion and nuzzled her daughter to make sure she was okay, and still smelling just right. I knew she smell as sweet as could be, ’cause I already had my nose right down in her neck right before I let her go to Belle. Dad kept his head low, like he didn’t care at all, hitched up his leg before he headed over to the cat dish with some nice warm milk for them. The milk was still blue-milk, so we couldn’t drink any yet. The cats loved it. “That’s it. Ladybird. Her name is Ladybird.” I knew as soon as I heard it, that was the right name for such a fine calf. Belle swished her head back again and sprayed some of her spit all over my arm. She loved spraying spit up against her back to get the flies off. It wasn’t her fault I was in the way of that. Still and all I never appreciated that habit of hers, it was pretty yucky, kinda like when men spit just to impress each other, only Belle had a good reason; she had to get the flies off her back. Dad spit sometimes, but only when other men were around; that’s when he said bad words, too. Not exactly curse words that can send you straight to hell if you die before confession or an honest act of contrition. Those other bad words that get a kids mouth washed out with soap, and probably land you in purgatory on the simmer plate for a while. Mom took me to the grain elevator to pick out a curry comb and brush and a halter, so I could keep Ladybird groomed and teach her to walk proper. Ladybird was a wonderful companion. She started to look forward to seeing me out in the barn; I could tell, ’cause she reached her neck right out to me, and sucked on my fingers, even after she learned to drink from a pail. She loved her neck scratched. 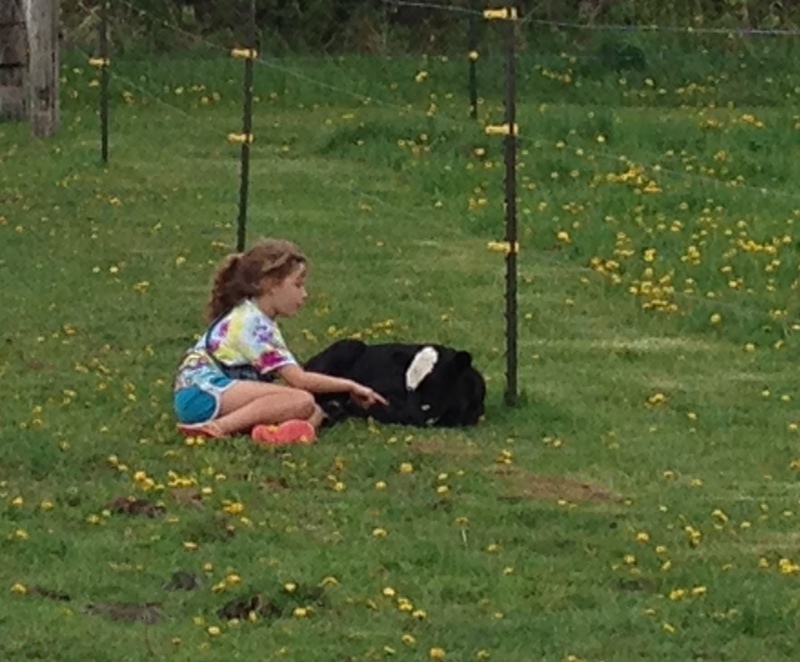 I loved to lay down next to her in her pen, and curl right where she curved her back legs around her front ones. She smelled so good and clean, like any baby. Just like with a human baby, sometimes there was dirty work to do, like cleaning out the manure and putting fresh straw in for Ladybird to lay down on. For certain, that’s what made her smell so good. That and keeping her brushed and giving her baths. There was a bit more to it than most people guessed: I cleaned her hooves with a scrub brush, and painted her hoofs with clear fingernail polish to make them shine, and I braided her tail, then brushed it out all fluffy and full. If she got any yellow on her white parts from laying down in a dirty spot, I dusted the yellow with baby powder, so she was white as snow in those parts again. part. 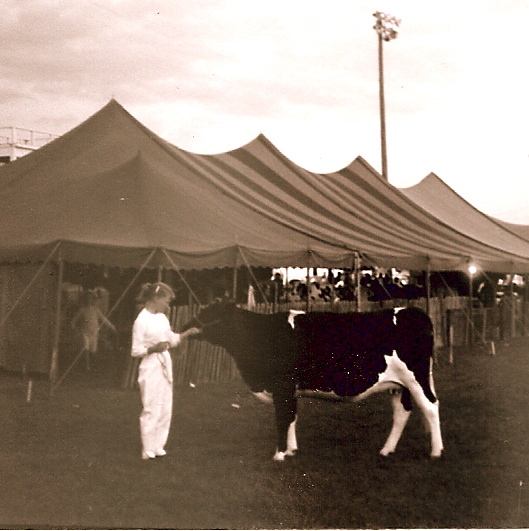 She had to behave herself in the show-ring, and when it was time to stop, she had to stand just right: front feet together, inside back leg stretched out behind the outside back leg; that’s so the judge could see her udder properly. Ladybird didn’t have an udder for two years, ’cause she was just a baby, but she knew how to stand just perfect. I had to wear all white pants and white, long-sleeved shirt for the show. Keeping all those white clothes clean was way harder for me than keeping Ladybird clean. I was a regular dirt magnet, for some reason. Deanna, always looked neat as neat can be, like she just stepped out of a picture in a magazine. I never could figure out how she did that. Sometimes she looked pretty when she got out of bed in the morning. Not me. Later, when I got older, I learned to judge dairy cows. It is truly like a beauty contest. Points are given for the markings, the cleanliness, the shape and size of the udder, the length of the legs, how properly the cow stands, and even how the veins run across the udder. Practically the only difference between the Miss America contest and dairy cow judging is nobody asks a cow any of those crazy questions that have no correct answer. Of course, cows have lots of time to ruminate, so perhaps if they could talk, they would provide us with the answer to world peace.